Well over a month ago, I started reading Anne of Green Gables to my daughter at bedtime. I figured it would be nice for her to know the story before we take a trip to Prince Edward Island this summer. Since Anne is everywhere over there, it would enhance the experience for the girl to know who this person is and why all the fuss. If you don't know, the gist of the story is an elderly brother and sister send away for an orphan boy to help them on their farm. When the brother, Matthew, meets the child at the railway station, he finds an 11 year old girl, Anne, instead of a boy. He takes her home to Green Gables where his sister, Marilla, is annoyed at the mistake and intends to send her back to the orphanage. However, Matthew lobbies to keep Anne as he's completely charmed by the talkative red-head. Matthew has his way. 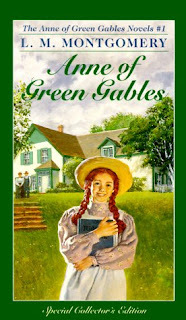 The rest of the book chronicles the next five years of their lives at Green Gables as Anne grows into a young woman. Sweet. An absolutely sweet story to read to your child. I can't say she understood everything. Montgomery doesn't use a small word when she can use a ginormous one and purple prose doesn't quite cover some of her descriptions. My girl loved Anne and how much she talks. Anne reminds me of her; she only stops talking when she sleeps. She also giggled every time Matthew said, "Well, I dunno..." which was often. I enjoyed reading all those funny moments again: Anne dying her hair, Gilbert and the slate, Diana and the raspberry cordial (though I had to explain what drunk meant). She enjoyed those stories too. There was one part I was dreading reading, and if you read it you know the part I'm talking about, there is death in Avonlea as well as life. It was very hard to read that section of the story but I managed it. My daughter's reaction was subdued, all she said was, "Why do books have to have sad parts?" Maybe because the sad parts make the happy parts all the more sweet. Anne was definitely a hit with the chicklet. Hopefully, someday she'll read Anne of Green Gables on her own but I'm glad I got to share with her first. PS- Will now have to find the Megan Follows film version on DVD. I love Anne too and have it slated for a re-read in the near future. Did you know that L.M. Montgomery's journals are in print in 5 volumes? Warning--they're interesting, but not at all a happy read. I loved sharing Anne's stories with my daughter, too. And I have never been to Prince Edward Island but would love to go because the stories affected me so much when I was a kid. The Megan Follows film version is delightful and very true to the story. I read this series last spring. I love love loved it. I kind of wish I had them when I was younger, but I guess I can fix that when I have kids. It's lovely seeing what you have done for your daughter by giving her that gift of Anne. Also, I agree with you on the sad parts, they do make the happy ones all the more sweet. Great idea to read this one along with her. This is one of those books that I didn't enjoy as much simply because I grew up on the delightful Megan Follows as Anne in the movie version. I still love that version, and the book couldn't live up. Sick to say that, I know. Anne of Green Gables made my childhood. It remains one of my favorites, and the Megan Fellows movies were worn out at my house. I recently found a picture book version to read to my pre-schooler. She loved it! I hope you enjoy your trip to Prince Edward Island. It has been a dream of mine to go there. I hope to hear about it when you get back. I read it to my daughter last year and she's a big fan. Recently we Zipped the movie version, but I think she enjoyed the book more. I'm now reading he Budge Wilson's Before Green Gables. Speaking of tough topics, try alcoholism. We're still enjoying the book, mind you. Your trip to Prince Edward Island sounds so much fun and I would think that reading that book beforehand would definitely be in order! What a great book to share with your daughter. how sweet to read it together! I loved Anne when I was a youngster. Anna- Maybe she'll give it a try after her scary book phase. Amy- I had heard that. LM had a lot of issues, I believe. Karen- I loved the movie when I was a kid. Hopefully, it will hold up. April- I wasn't a kid when I read Anne. I was in my late teens. I wish I had discovered her as a kid too. Jennifer- A picture book sounds sweet! John- I can imagine. Anne briefly mentions the drinking habits of one of her foster parents. Tyrie- Not lame! Thanks for visiting.